Dave Brat got himself good and grilled at a boisterous town hall meeting May 9th. 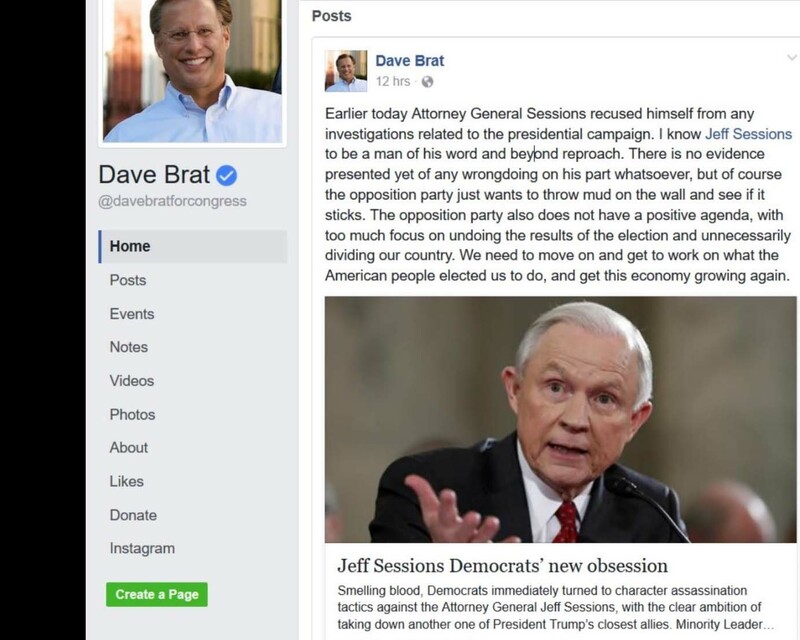 Brat took a question on whether he’d support the appointing of a special prosecutor in light of the Comey firing, which Trump was urged to do by a supposedly recused Jeff Sessions. See Brat scramble for shelter, finally adopting the peculiar view that his constituents must bring him evidence FIRST in order for there to be an investigation. Dave Brat leaping to the defense of his good pal, Jeff Sessions. Alarm over Trump-Russia is nothing but mud-slinging by Democrats and let’s quick change the subject. HUH?! Gee, in Olden Times it was the other way around: you investigated to see if there was evidence! But we’re living in a world of alternate facts, so…. And besides, I’m not a sanctimonious seminary graduate, ethicist, economist, so maybe I’m just too simple. OR, maybe the tweet on the right, sent by Brat the day Sessions recused himself, gives his real view of our concerns: we’re just slinging mud. I have already suggested that Brat’s close ties to Sessions and other Trumpistas may mean he has insider info on their scurrilous doings. Maybe that’s why he’s got himself in a nice little knot and looks a bit sweaty on the video answering that question. So, here’s my shout-out to my Congressman: You like to evoke your seminary training, which is supposed to make us think you’re a real ethical guy. You talk all the time about your reverence for the Constitution. You were asking us for evidence; well how about you prove you are who you say you are: defend the Constitution and call for a special prosecutor. A treat for readers: most of the town hall with an appearance by a particularly waspish Amanda Chase.